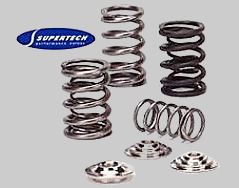 ☼ Valve springs are made with premium Superclean Chrome Silicon Vanadium Steel alloy for higher performance & durability at high rpms and better memory. ☼ Computer designed to ensure that wire stress levels do not overpass the limits of stress defined in the diagrams of fatigue for long durability under extreme conditions. ☼ Computer software also allows us to make sure that the harmonics are well under control. ☼ The Retainers are manufactured with high quality military certified Titanium alloy, CNC machined for a tight fit that will ensure a long durability.